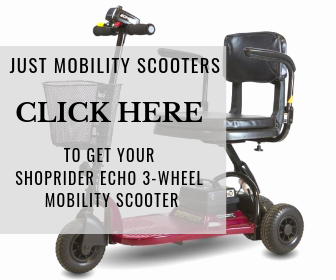 Here at Mobility Guardian we want to provide up to date news on ALL mobility technology so we’ve made this mega post of the best inversion table reviews just for you. Inversion tables are used to reduce back pain, fatigue, and increase circulation. The aim of using one is to decompress the spine, similar to getting an adjustment at the chiropractor except you perform it in the comfort of your home. I know you’re here to learn more about the products so let’s get into the best inversion table reviews! 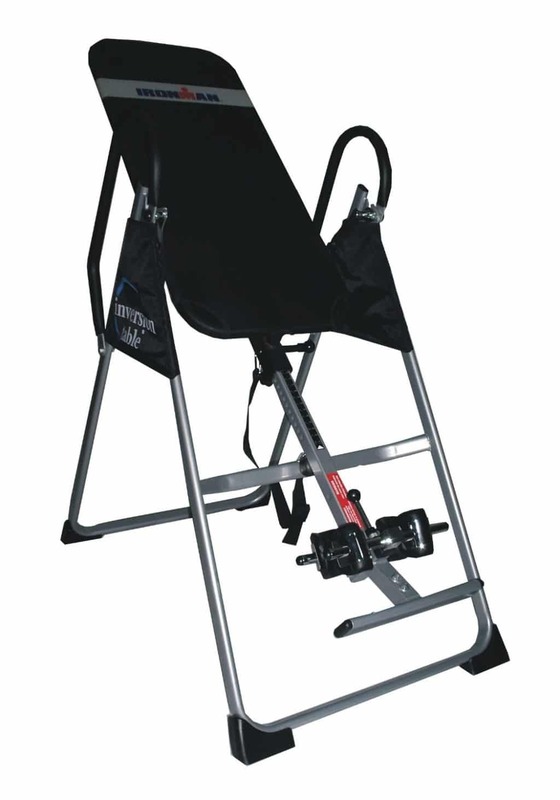 Click here to buy our top rated inversion table on Amazon! 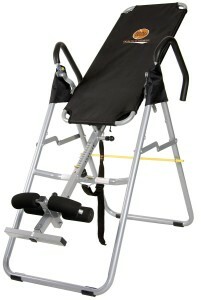 This is a really great inversion table for the medium price range. It features sturdy construction, molded ankle holders, and it folds up. It’s easy to assemble and the entire device is very comfortable to use. Users say that their backs feel really great after using this specific model. It is however a bit heavy so be careful when lifting it if you do purchase one! Check out our full product review of the Ironman Gravity 4000! This is a great budget friendly inversion table that will turn you upside at the least – which is what inversion tables are designed precisely for. This table is easy to adjust, and has locking ankle supports to keep you stable while you invert. Enjoy easily adjustable settings, comfortable foam rollers, and safety locking features. This table is a unique model – offering advanced infrared heat therapy built into the table. The construction uses ultra-thin carbon fiber heating elements in the backrest to help soothe muscles while you invert and relax. This table has the additional benefit of heat alongside reducing back pain and fatigue all while increasing blood circulation. It is on the more expensive side but the heat is a nice feature for anyone looking to relax while inverting. This is probably one of the best inversion tables on the market. 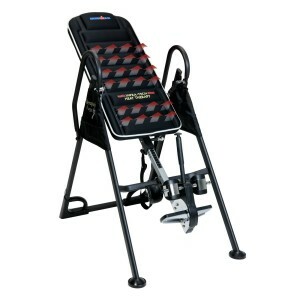 Another great inversion table with solid construction priced for entry. You can pick up the Ironman Gravity 1000 for only $150 and be inverting in no time. It’s constructed using a steel frame, nylon for the padding, and has a nice powder-coated finish. This table can support up to 300 pounds and has molded ankle cushions with ergonomic features. The Teeter EP-560 is one of the more advanced tables on the market. It has several accesories to provide stress relief for your target areas. 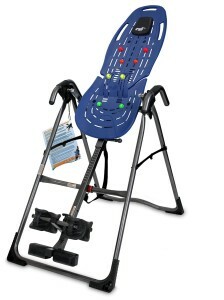 It works as a massage device and a traditional inversion table. It’s unique design has “Adjustable Acupressure Nodes” which will place pressure on muscle trigger points like a foam roller. This table is a really great tool to decompress your spine and get an amazing massage experience at the same time. 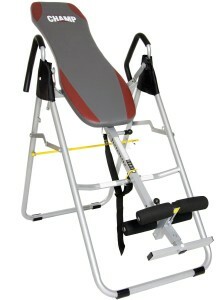 The Body Max IT6000 is a really great basic inversion table at an affordable price. The height range for this table is 4’8″ to 6’3″ and can be easily adjusted for your measurements. It has a 250 lb capacity and safety straps for controlling inverting angles. I’m going to take a moment to always refer you to check your specific inversion table’s instruction guide before using it. Essentially all tables have the same end goal – just with a few different straps and structures here and there. You will be strapped in by your ankles and invert yourself to stretch out and decompress your spine. You will need to get used to hanging upside down and at first it may feel a bit uncomfortable. Be sure to always follow the instructions given with your specific table. Here’s a really great video I personally used to learn how to use my table. https://www.youtube.com/watch?v=CVueDpBop_w She straps herself in, places a towel under her neck, and pushes her arms down to eventually invert her body. I’d recommend having someone nearby watching you for your first few attempts in case you need to be flipped back up or even want to be inverted further. 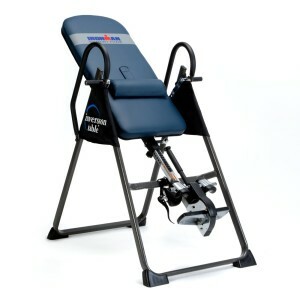 Here’s another quick video showing some of the exercises listed above: https://www.youtube.com/watch?v=Tib4JjqkjwI We hope you enjoyed this mega inversion table review article – inversion tables really are a great tool to have in your arsenal. I’d recommend inversion tables for anyone with chronic back pain looking to get some relief. You’ll need to be dedicated to using your table regularly but it will definitely pay off. Thanks for reading, and if you do decide to pick up the best inversion table – check out our top pick on Amazon here.